Our Club news in our local papers! 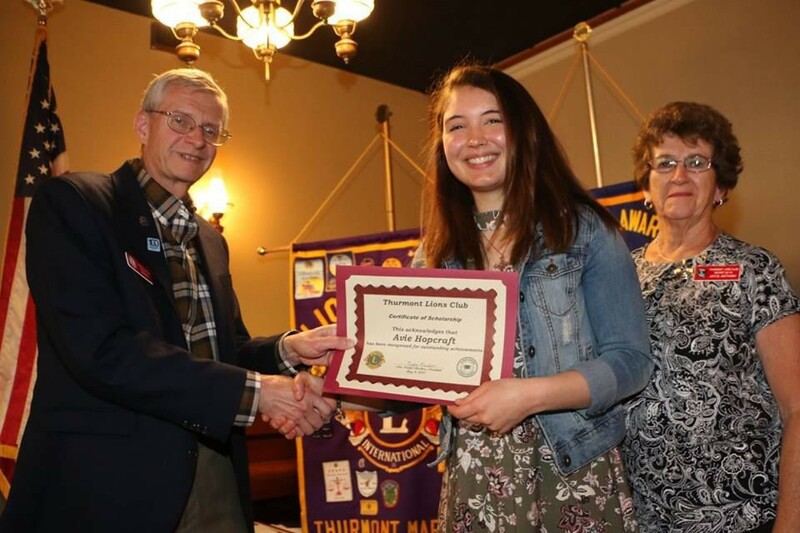 Community Night is an evening when the Thurmont Lions Club can shine a light on community organizations, as well as sight-related organizations. Recently, funds were donated to organizations; however, funds were previously donated to the schools, scholarships, teachers, Lions Vision Research Foundation, Leader Dog, LCIF, Lions Saving Kids Sight, District 22-W mobile screening van, Lions Youth Foundation, Thurmont Food Bank, Maryland Medical Eye Bank, etc. There were 18 organizations receiving donations covering everything from Guiding Eyes for the Blind to Lions Saving Kids Sight; from the Maryland Parents of Blind Children to Guardian Hose Company; from Frederick County 4-H Therapeutic Riding Program to Catoctin Community Medical Fund; from Thurmont Senior Center to Seton Center; from St. Joseph’s Ministries/St. Catherine’s Nursing Center to Community Foundation of Frederick County; from Catoctin Future Farmers of America to Hearing Loss Association of America/Frederick Chapter; from Children of Incarcerated Parents partnership to Thurmont Ambulance Company; from Thurmont Lions Club Leo Clubs to Thurmont Scouting Inc. and from District 22-W Diabetes Awareness to Thurmont Regional Library. Representatives from each organization were present to be recognized and receive their donation. The club is always looking for dedicated men and women with a desire to serve their community. 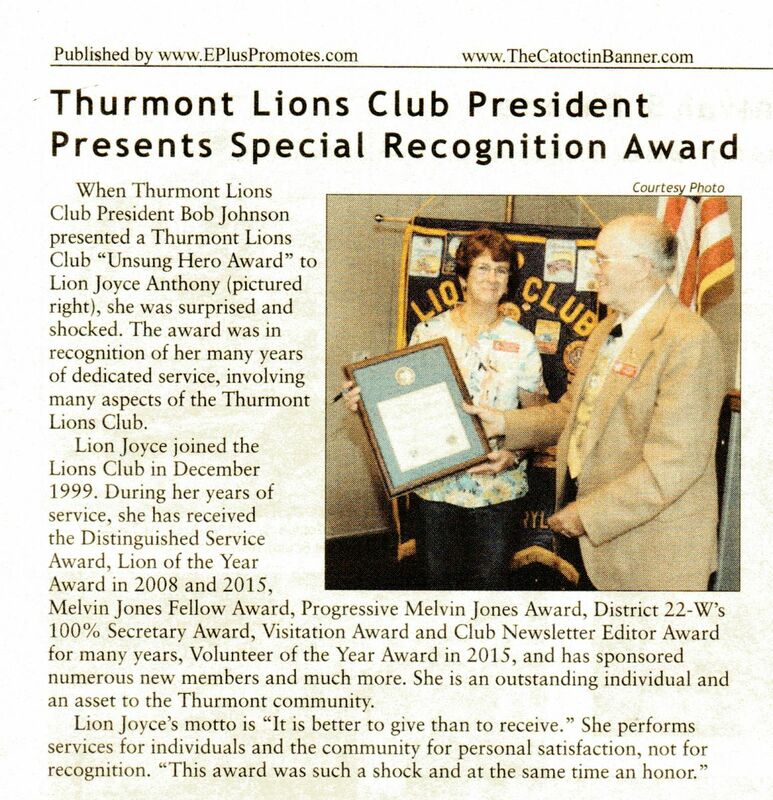 For more information, visit www.thurmontlionsclub.com or call 301-788-0855. Cameron Hewitt, Catoctin High School Class of 2018 pictured with Lion Bob Kells. 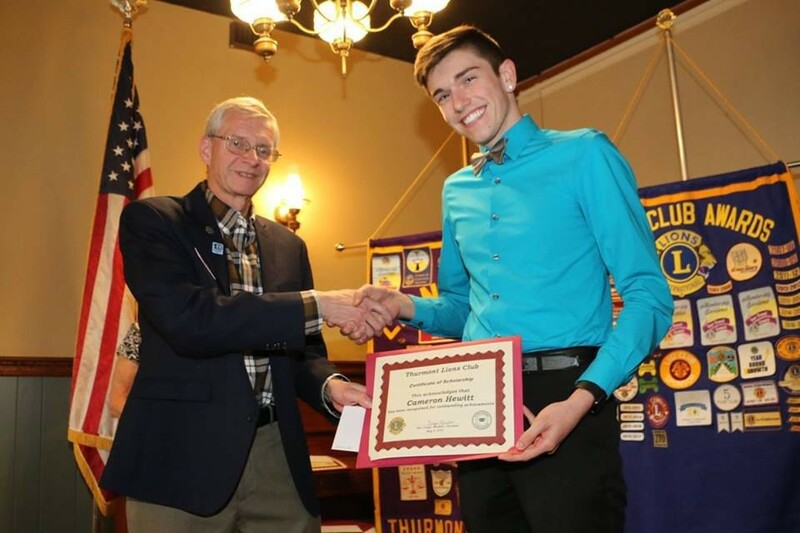 During the Thurmont Lions Club Education Night ceremony on May 9, four scholarships were awarded to Catoctin High School seniors. Three scholarships are awarded competitively based on academic achievement, participation activities and financial need. These students not only achieved honors, but also spent many hours performing volunteer work, along with participating in a wide variety of activities. Community service is one of the most popular extracurricular activities for high school students to do in their free time. These volunteer hours are very impressive when your application is reviewed for college acceptance. Three $1,000 scholarships were awarded to CHS seniors: Cameron Hewitt will be attending University of Maryland; Avie Hopcraft will be attending Baylor University and Sean Miller will be attending Rensselaer Polytech Institute. Hannah Barth was awarded the Vic Jagow four-year scholarship. Barth was awarded $1,250 for her fourth year of a four-year scholarship. She will be attending the University of Wisconsin. The student receives the scholarship for four consecutive years depending on their grade-point average. These scholarships are made possible from the community birthday calendar fundraiser that has been granting these scholarships for over 46 years. These deserving seniors and the Thurmont Lions Club thank supporters for their generosity. Melissa Kearchner, left, was named 2017-18 Teacher of the Year by the Thurmont Lions Club. Lion Joyce Anthony is pictured with her. 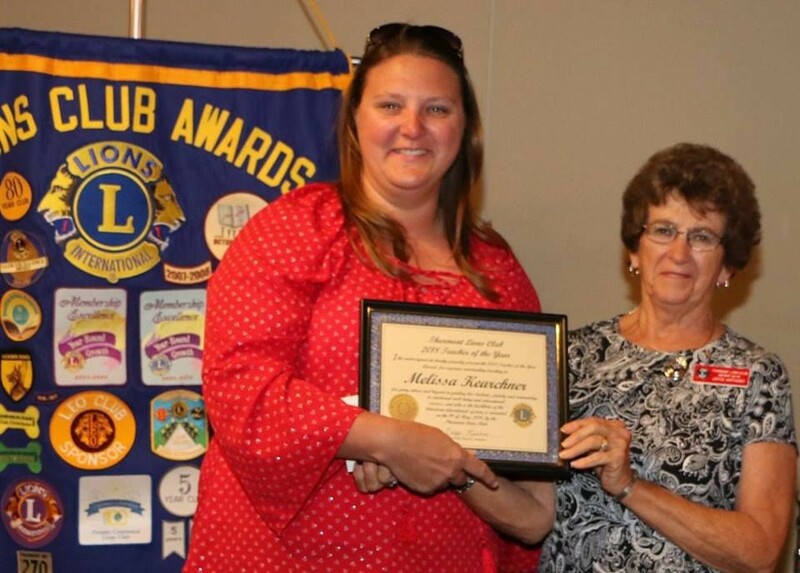 The Thurmont Lions Club recently recognized teacher Bonnie Hopkins, who retired at the end of the 2017-18 school year. 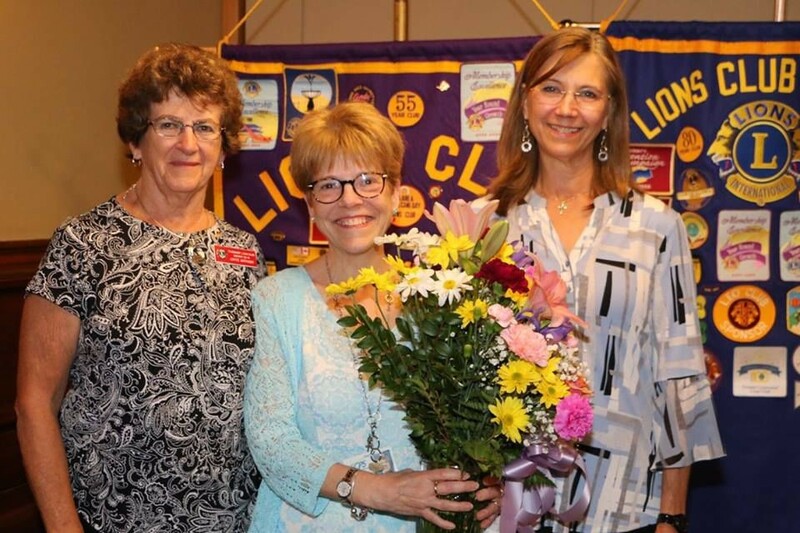 From left are Lion Joyce Anthony, Bonnie Hopkins, and Lion Stephanie Steinly. The Thurmont Lions Club held their Education Night on May 9 with Mark Pritts, Frederick County Public School’s instructional director, as the guest speaker. Earlier this year, the club held its Teacher of the Year reception where eight teachers were honored as Teacher of the Year for their respective schools. The 2017-2018 Teacher of the Year was Melissa Kearchner, Emmitsburg Elementary School. She was nominated by a fellow teacher, parents and students. During the Teacher of the Year program, the club became aware of Bonnie Hopkins, a teacher who has devoted her career to helping young students start their education years in a positive and motivated manner. Hopkins retired this year and the Lions Club thanked her for her commitment to the students of northern Frederick County. After a number of the businessmen of Thurmont met informally at lunch for a number of months in early 1929, they decided to explore the need for a civic organization to serve the community. A committee was formed to get in touch with several such groups operating in other parts of the county. It didn't take them long to decide upon the Lions Club as their choice. With the help of some members of the Frederick Lions Club, who became their sponsor, a promotional meeting was held in the old Town Hall on October 23, 1929 and an open invitation was made for prospective members. The original signers for the local club included Lester S. Birely, Victor M. Birely, Dr. Morris A. Birely, Allen Creager, John Creeger, Wilber R. Freeze, William J. Stoner, Harry W. Ruch, H.A.C. Sylvester, and Raymond Creager. The actual charter was presented to the club at the November 1, 1929 meeting with the following additional members listed on the charter: Carl S. Gall, Parmalee D. Ewing, Frederick Tresselt, H.Q.Miller, Ray R. Taylor, Claude A. O'Toole, Dr. James K. Gray, D.S.Weybright, Ernest P. Hammaker, and Leonard R. Waesche. The orginal meetings were held in the Mrs. Ruth Eyler Restaurant located across the street from the earlier day Thurmont Library on Water Street. Since the restaurant's closing shortly thereafter, the meetings were held ever since at the Cozy Inn Restuarant. The meetings are now held at the Mountain Gate Family Restaurant. The Lions Club was largely representative of the business men and agricultural operations of the community. Over years the organization has evolved to include other members of the community who were interested in taking part actively in civic, commercial, social, education and moral welfare projects. Today, many on the club's roster of active members include interested women in the community. For 73 years, the club has been an exceptionally good forum for discussion and action on matters of public interest. 1967-68 W. Roy Hoover Jr.
1985-86 Frank C. Long Jr.